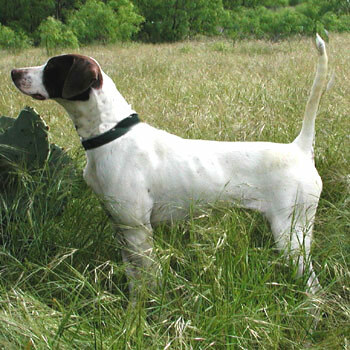 Phantom�s Texas T is a beautiful specimen of the English Pointer breed. She weighs about 48 lbs, has very straight legs, tight feet, and perfect teeth. She is a hard running West Texas bird dog, with lots of style and stamina. Her pups are very bold, intelligent, extremely birdy, and classy. She comes from a long line of great English pointer bird dogs such as National Ch. Texas Trailrider, Ch. Black Rain, Ch. Thin Man�s Image , Ch. Evolution , Ch. Rock Acre Radar, and Ch. Prairie Dancer.